Multi-award-winning Dublin-based Brokentalkers have built a reputation as one of Ireland’s most innovative and original theatre companies. The company was formed in 2001 by Feidlim Cannon and Gary Keegan after graduating from De Montfort University, Leicester. Their work explores new forms of presentation that challenge traditional ideologies of text-based theatre. The company is committed to a collaborative process that draws from the skills and experiences of a large and diverse group of contributors from different disciplines and backgrounds. Some are professional artists and others are people who do not usually work in the theatre but who bring an authenticity to the work that is compelling. The company are internationally acclaimed and well known to audiences around the world with work such as Have I No Mouth, The Blue Boy, Silver Stars and In Real Time. To date, the company has presented work in Australia, Belgium, Canada, Finland, France, Germany, Iceland, Italy, Netherlands, New Zealand, Poland, Portugal, Romania, Russia, Spain, Sweden, the UK and the USA. Feidlim and Gary are delighted to announce that Age and Opportunity have asked Brokentalkers to join the team and assist in curating the Bealtaine programme. Brokentalkers continue development of their new production Woman Undone, which will be presented at Project Arts Centre in November 2018. 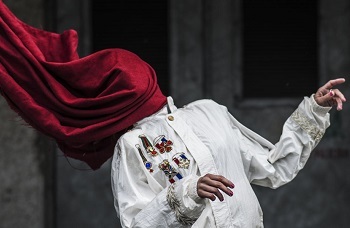 Feidhlim and Gary will undertake a residency in Grangegorman from March to July, working with young people in different communities which will culminate in a performance piece to take place mid-to-late July. This residency is funded by Create and by the Grangegorman Development Agency. The company are also working on a performance, commissioned by UCD School of History in collaboration with prisoners, based on the theme of health in prison, to be presented in July. Brokentalkers will travel to Norway in June to attend the Arctic Arts Festival, which will host a performance of their play Have I No Mouth. In April, the duo will also producing a short film in collaboration with the community in Ballyfermot. A major new dance theatre performance The Circus Animals’ Desertion is a poetic response to the imagining of nations, inspired by the Automatic Script experiments of Georgie and William Butler Yeats in which they called upon the spirit world to assist with their creativity. It juxtaposes the romantic notions of nationhood put forth by Yeats and other early 20th Century poets and revolutionaries with brutal realities of extreme nationalism in the light of the radicalisation, xenophobia and oppression engulfing the world today. Sampling texts and imagery from Yeats’ plays and poetry as well as archive recordings and interviews, the piece is performed by an international cast of dancers and musicians. Brokentalkers debut The Circus Animals’ Desertion at Dublin Theatre Festival 2016. In this production Brokentalkers respond to the current refugee crisis gripping Europe and the notion of sovereignty of one people over a piece of land; and the lengths people will go to bar entry to their dominion. A private beach inhabited by a family; a European family. They are the owners of the beach. The beach has been ‘in their family’ for generations.The family celebrate a wedding, a union between two sides; each of whom can offer something to the other. Security, prosperity, progeny. During the wedding celebration a stranger arrives on the shore of their beach. The family must decide how to deal with this stranger. A co-production with the Munich Kammerspiele, the Goethe-Institut Irland and developed at FRINGE LAB. This Beach debuts at Tiger Dublin Fringe 2016. In collaboration with Junk Ensemble, It Folds is a reverie. A dream-like story of death, grief, beauty and humanity. It’s a poignant and humorous portrait of the tragicomic events that shape our everyday lives. Fusing the distinctive choreography of Junk Ensemble with the innovative theatricality of Brokentalkers, It Folds features a large cast of Irish and local Bristol performers brought together to present an assortment of characters who attempt to find connection through their shared humanity. Winner of the Best Performer at Tiger Dublin Fringe Festival 2015, It Folds is heading for Edinburgh Fringe this August 2016. In this bold production, Brokentalkers examine perspectives on health, ageing and the future from the point of view of two different generations. Featuring an original soundtrack by Sean Millar and choreography by Jessica Kennedy (Junk Ensemble), Frequency 783 explores the hopes and fears of two people who dream of a future that they may never have a chance to realize. 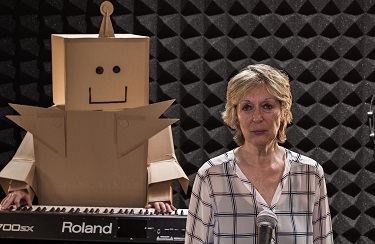 Have I No Mouth is a powerful piece exploring the changing nature of the relationship between a real-life mother and son in the aftermath of a family tragedy. Written and performed by Brokentalkers‘ Co-Artistic Director Feidlim Cannon and his mother Ann, the production takes a brave, unflinching look at their past and attempts to piece together the truth, whilst exploring different ways we heal ourselves after the unthinkable happens. Ann and Feidlim are joined on stage by professional psychotherapist Erich Keller. The Blue Boy deals with the experiences of men and women who were incarcerated as children in Catholic residential care institutions in Ireland. Combining a highly physical live performance with recorded testimony from former residents of institutions, The Blue Boy gives a fresh theatrical voice to recently revealed stories of child abuse in Ireland. 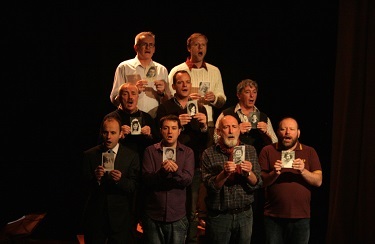 Silver Stars is a moving and eloquent song-cycle, which tells the truly extraordinary real-life stories of older gay Irishmen, men in search of happiness and fulfilment, in a country that was challenged by their very existence.